Johannes Hevelius (1611-87) named this little grouping of stars Lynx after the European form of the animal in 1690. It contains some close double stars, but little else of note. 49k JPEG NGC2683 (Best 67) is an edge on spiral galaxy located in southern Lynx, 55' north of Sigma 1 Cancri. Dreyer describes it as very bright (mag. 10.4), very large (9.3'x2.2'), and very moderately extended in p.a. 39°. It brightens gradualy, but very much toward the middle. 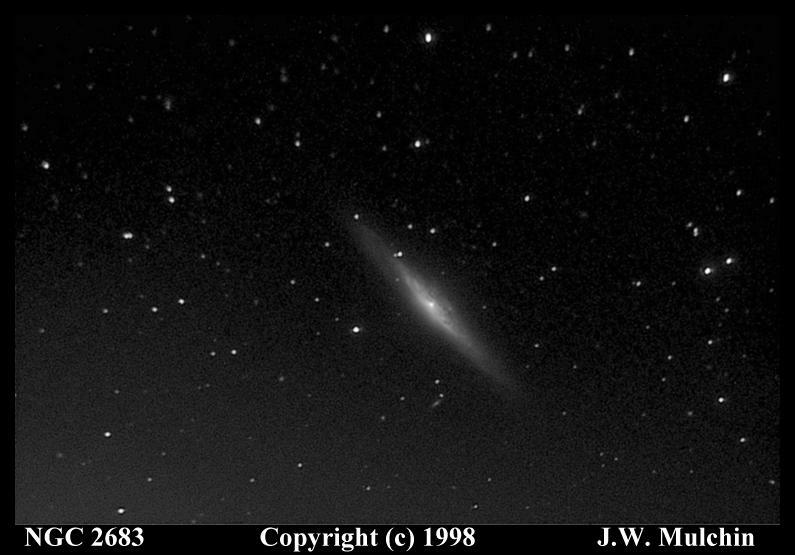 This galaxy shows details in a 10" and benefits from relatively high magnifications. Image by Jerry and Wanda Mulchin, taken on a 10", f6.3 SCT with an SBIG ST-8 camera. 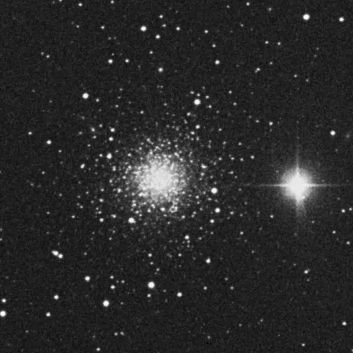 22k JPEG NGC2419 (Caldwell 25) is a globular cluster described as fairly bright (mag. 10.4), and fairly large (4'). It contains no stars brighter than mag. 17, and cannot be resolved in amateur scopes. How did this least resolvable of globulars make the Caldwell list? It is the most distant globular that belongs to our galaxy. That said, at 210,000 light years, it sits farther out than the Large Magellanic Cloud. Located 7° north of Castor (Alpha Geminorum), it sits in a sparse area of sky. A mag. 7 star sits 4' west of the cluster. Image from the Digital Sky Survey.